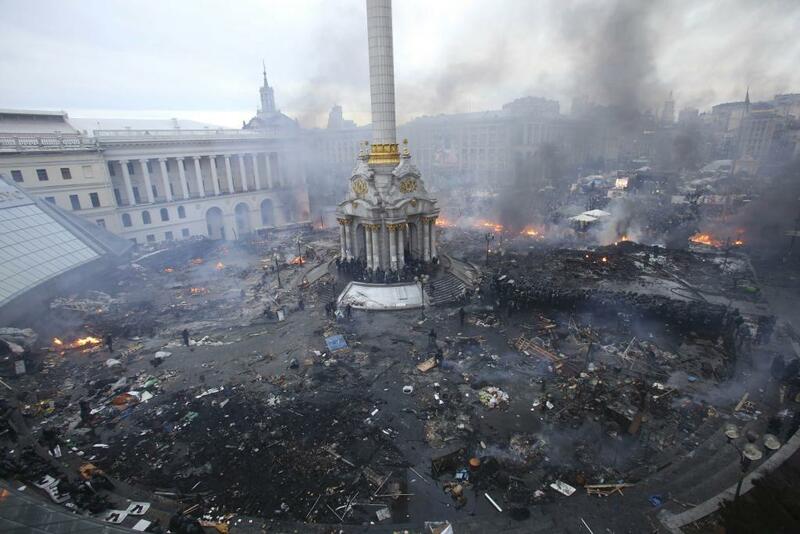 Question: How would you explain what is happening there in Ukraine? What did happen in Ukraine to bring it to such war situation now? Answer: The Ukrainian crisis is a multi-level phenomenon. It developed against a background of bad social and economic situation of working people arose from continuous neoliberal reforms after the end of "Soviet Union". This situation led to deep discontent in the society. But it is not this social discontent which produced the so-called Euromaidan protest in 2013, but the political games in the ruling elites of Ukrainian "oligarchic democracy". The protest actions for integration in the EU were started by a little bunch of youths from the "middle class", and the obtained a organizational, financial, political, medial etc. support from the oppositional tycoons and parties which wanted to depose their competitor, the little group around President Yanukovich. It was from the beginning not a social protest but a clear political multi-class movement with no less reactionary characteristics than the Yanukovich regime. During the long and violent confrontation on the streets between the opposition and police forces, the protesters begun to arm themselves, and the openly ultranationalist and neofascist forces and groups conquerred a hegemony on the street and in the discourse. After the violent overthrow of Yanukovitch in Kiew, a counter-movement arose in the East of Ukraine, at first, with the federalist demands, and then under the banner of Russian nationalism and separatism as a counter-play to Ukrainian nationalism of Maidan. This movement is also under the leadership of bourgeoisie, and the pro-Russian ultra-rightists and neofascists playing a very significant part here. The separatist regimes in Donbass are no less reactionary then in Kiew. And there is a civil war between them. The intervention of foreign powers is another decisive factor in the crisis. The USA, the states of EU, the NATO and the Russian state have manifold interests in Ukraine: economical, political, strategic and military. The worldwide struggle for a new repartition of World between the capitalist powers continues, and they wage a "substitute" war on the soil of Ukraine. Western powers supported from the beginning the Euromaidan and then the new, the NATO-oriented regime in Kiev, giving to new rulers money, consultants, weapons and dictating the politic designed by IMF. On the other hand, the Kremlin used the situation of quasi "failed state" in Ukraine to annex the Crimea and to help to Eastern separatists, directly and indirectly. In such a way, the foreign powers struggling each other using their puppets in Ukraine. Question: Ukraine actually has a long anarchist tradition, people were telling me that everybody in Ukraine known or heard something about anarchism, did any anarchist really root in the society today, if not why, if yes how? Answer: This tradition existed of course, but it was interrupted by Bolshevist and Stalinist repressions as in other parts of "Soviet Union". It`s true that almost everybody in Ukraine heard about Nestor Makhno, but people consider him as a "popular hero" rather as an anarchist. This lead to very strange phenomena. Both Ukrainian nationalists and people from East of Ukraine take now Makhno as their "own", without having any real understanding or knowledge about Anarchism and about it aims. So we can`t say that the anarchism has more roots in the Ukrainian society than anywhere. The society in Ukraine is atomized as in the other countries of ex-"Soviet Union", and the workers haven`t a class or libertarian consciousness. Question: Well about the anarchist history in Ukraine, was it only Nestor's army or was there other existing anarchist faction, what were they like, if they are now existed in any other different way? Answer: Properly speaking, the Makhnovist army was not anarchist; it was rather a formation of local / regional self-defense, consisted mainly of peasants. Among the political active people, there were not only anarchists therein, but also members of "Party of Left Social Revolutionaries", non-party people or sometimes also rank-and-file Bolshevists. And this army didn`t have any "anarchist program": it declared only that it aimed to liberate the population of the dictate from outside and to give to it a possibility to organize the life how people wanted. There were only few socialized industries or agrarian communes; the traditional structures of peasants self-administration dominated in the countryside. But it`s true that the anarchists played a key role both in the army and in the constructive work in the liberated areas. The principal anarchist organization was the "Confederation of Ukraine`s Anarchists "Tocsin"". It was surely a most attractive anarchist association which participated in the Russian Revolution 1917–1921. It militants (Voline, Aron Baron etc.) had most developed and radical revolutionary ideas, combining anarchist communism as the goal, syndicalism as the means and anarchist individualism as a philosophy, and they proposed to all anarchists to unite themselves on this ground. The militants of "Tocsin" organized worker unions / syndicates, initiated the building of free Councils and their Congresses, made a school, cultural and propaganda work, and they struggled also in the army of Makhno. This organization was destructed by the Bolshevik State simultaneously with the suppression of Makhnovist movement; some militants were arrested and later executed, the other get in foreign exile. But there were several attempts to rebuild the "Tocsin" in the underground, up to the beginning of 1930s. The repressions of the State were terrible. Unfortunately, this tradition was interrupted. The new libertarian movement in the Ukraine emerged in the time of Soviet "Perestroika", in the beginning as a part of an Union-wide movement. Like the most libertarian groups in Russia, it was rather "moderate", sometime supporting the ideas of a "market socialism without state" or some other strange things. In the 1990s, two principal centers of movement appeared. The first, the so-called "RKAS Makhno" had it strongholds in the East, in Donbass. Despite some allusion to anarcho-syndicalism, this organization was more or less "platformist", i.e. it advocated a building of a centralist "anarchist" party for leading unions or other social movements. There were also some moments of a quasi-religious sects in it: there was a real leader who was in the same time a teacher of martial art Wing Chun, and the trainings get hand in hand with the mental influence and "anarchist" postulates. In the 2000s, the leaders of the group tried to build a new "platformist" International, with the groups or people from Ukraine, Russia, Georgia, Bulgaria, Germany, Israel etc., but this project failed after a short time. After the beginning of actual civil war in the Ukraine, the RKAS ceased it activities: some militants supported the Ukrainian state, some others get to separatist army units, and the leaders declared the organization "frozen". The other center of movement was in Kiev. It was from the beginning more "new leftist" or sub-cultural, partly with intellectual semi-marxist interests. In the 1990s and 2000s, they animated a semi-syndicalist student union "Direct action", together with the Trotskyists and some other Marxists. The group didn`t have any clear conception of anarchism, mixing together some platformist, syndicalist and neomarxist elements. Then they proclaimed creation of an "adult" organization, "Autonomous Workers Union" (AWU), which contacted the Swedish SAC and other reformist syndicalists abroad. After the beginning of the actual crisis, the more important figures in the AWU supported the Maidan, declaring it a "bourgeois revolution". They defend the Ukrainian "national liberation" and the actual regime in Kiev against Russia, rejecting the internationalist position against all states, governments and nations and welcoming the NATO. Some members of the AWU consider such position "too nationalist". They consider themselves "internationalist" and created a group "Black Rainbow", but they miss until now to reject Maidan and to break definitely with the nationalist leadership of AWU. Question: Ukraine in recently years have a lot of political active group appears. When we say political, it says it is almost a pan-political trend of people thinking if they act under the name of the "nation" or a certain big name such as "feminist" or such they are rather promoting a democratic or post colonized (reflects to the culture imperialist they have faced in such politcal-economical weakness in Europa) under its acutal political/economic situation. What do you think, what are the real interests of the people in this? Are they facing a very difficult time that they are using a lot name to confused people what are the real problem? And what is the reason it brought such an revolt with the people? Answer: It`s a very important point. This problem exists not only in Ukraine, it is worldwide. In the last years, we see a lot of movements in different countries (from Egyptian Tahrir to "movement for free elections" in Russia or "umbrella protest" in Hong Kong), where there are no social and economical demands but only striving for removal of some politicians and for replacing them with others. Moreover, because the demands for any real different social politic are absent, these new rulers obtain in the fact a "carte blanche" for the continuation of the same (or for the carrying out of even worse) politics against working people. These movements are usually multi-classist and occur under the hegemony of bourgeoisie and oppositional politicians. The active political or non-governmental groups mentioned by you consist partly exactly of such people with "middle-class mentality" who think that the existing authorities, corruptions etc. hinder them to go upstairs. Sometime they name themselves a "creative class". But it`s true that sometime there are also working people who participate in these movement. The grounds are various: the democratic illusions, the lack of class and libertarian consciousness, the personalization of politics (with an identification of system problems with concrete politicians), the absence of any alternative idea about how the society can be reorganized etc. In our opinion, this is a very dangerous trend. We can and must participate only in the broader movements which promote an independence of working people from ruling classes and politicians, which help to destroy illusions and not to strengthen them. So pure "political-democratic" movements, without any real social demands and under the leadership of politicians, aren`t interesting for us as Anarchists. A normal decisive strike challenging a capitalist or any real social conflict in the neighborhood is a thousand times more important for the possible awareness-building of working people. Question: How would you explain why it bring such a war situation, politically and what it means to ordinary people? Answer: Both sides of the war don`t want to make any serious concessions, because they don`t want limit their power hunger. Both desire to have all. And the puppeteers from Brussels, Washington, Berlin, Moscow etc. incite them to this stubbornness. In the same time, the working people in Ukraine are too desorganized and have to less consciousness to stop this war really through mass actions or strikes. It`s true that there is a massive local resistance against mobilization and conscription (at least, in the regions under the control of Kiev; unfortunately, we don`t have a such information from Donbass). But it was not enough for stop the war. Question: Those anarchist outside who went to join the ANTIFASCIST army seems they have simplified what is happening in Ukraine, and it seems that they are also reflecting their failure in their own local that they search a war to fight against the visiualized enemy, rather the rooted enemy - state- capitalist in their own country. Would you give some example about what the Russian people think, and how this refelcts their own life struggle? Answer: I agree with your appraisal: this is unfortunately a very serious problem for activists of solidarity movement in the whole world and especially in the so-called "First World", where many generations of leftists were educated politically in the sense of a "collective guilt" complex against the "Third World Peoples" as whole. So they see in the other parts of the World often only what they want to see. A good example is f.ex. the appreciation of PKK regime in Syrian Kurdistan as a "libertarian revolution". For some libertarian people in Europe and America the "antifascism" is a magical word which can justify everything. Also a very active role of ultra-rightists under the so-called "antifascist" spectrum. Thereby they don`t want to see the presence of many Russian and pro-Russian neofascists in the armed forces of Donbass, speaking only about the neofascists on the Ukrainian side. Or they consider it not important at all because they think, the NATO / US imperialism is the "greater evil" etc. This reflects also the leftist ideas about "national liberation". And you have right: for some people it is also a kind of compensation for the inability to fight "at home", against local state and capital! As to reaction of ordinary people in Russian... I must recognize that not few people were carried by nationalist, patriotic sentiments and supported the annexion of Crimea etc. The nationalist hysteria organized by the state aimed also to distract the attention from the economic crisis in Russia. But little by little, in process of deepening of crisis, the number of people ready to suffer the real worsening of their situation for the sake of Crimea etc. decreased perceptibly. The population is discontent with low wages, high prices and other social problems (in health, education etc.). But it remains passive in majority: the level of social atomization is too low. Question: Lets called off the international support of the anarchist of the world in this war? Are they fighting this "for the ordinary people of Ukranie"? What is your personal idea toward Ukraine issue, what do you think what is the real thing that we can do in this ???? Answer: I think, the anarchist must don`t support any of belligerent sides in this war and any of imperialist state power or bloc. Of course, anti-war protests are important and necessary, but they must be equidistant, against all sides and states. And of course do not participate in such joint actions with ultrarightist only because they are against USA (as it occurs for example in Germany). It would be very good to support the deserters and conscription evaders and also strike movements and social protests in both sides of Ukraine. And if people want to send a humanitarian aid, it is strictly necessary to don`t give it to organizations close to any of belligerent sides: there is no guarantee that this aid will reach ordinary people. A such sending makes sense only through real independent organizations, with the possibility to prove the just repartition at place.